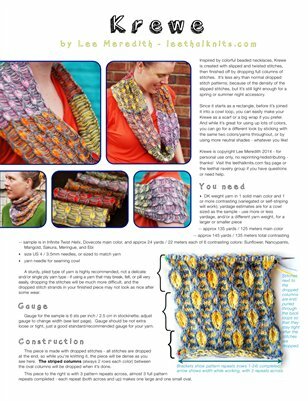 This is a knitting pattern for a cowl, or infinity scarf, or loop scarf, which can also be made as a normal scarf, or wider as a wrap. Inspired by colorful beaded necklaces, Krewe is created with slipped and twisted stitches, then finished off by dropping full columns of stitches. It’s less airy than normal dropped stitch patterns, because of the density of the slipped stitches, but it’s still light enough for a spring or summer night accessory. While it’s great for using up lots of colors, you can go for a different look by sticking with the same two colors/yarns throughout, or by using more neutral shades - whatever you like! See the Krewe page on leethalknits.com or on ravelry.com for photos and more details about the pattern.